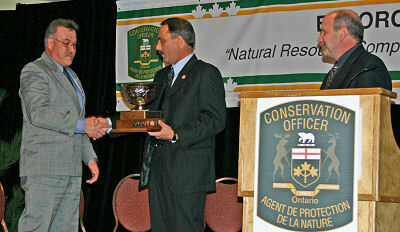 Conservation Officer, Gary Couillard was presented with the Officer of the Year Award by Serge Tenaglia, Director of Enforcement Branch, on Thursday, March 2, 2006 at the Enforcement Conference in Sault Ste. Marie. Gary began his career with MNR in 1973 as the Park Superintendent at Silver Lake Provincial Park. In 1975 he received his appointment as a Conservation Officer at Bon Echo Provincial Park in Tweed district. 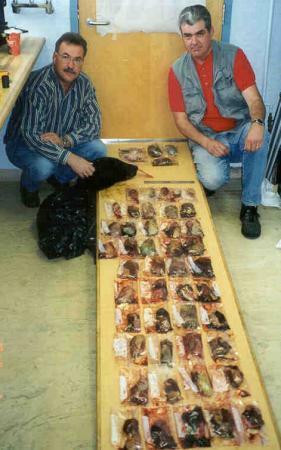 Gary moved to North Bay in 1979 where he spent the next 24 years as a Conservation Officer and District Investigator. Gary is currently acting as a Regional Intelligence and Investigations Specialist out of Timmins. During his career, Gary has worked on a broad range of enforcement activities, uniformed, plain clothes, undercover, working on countless numbers of special projects, intel gathering, mobile surveillance work and acting as a prosecutor. Gary has exemplified the highest standard of professionalism in all facets of his career. He has a unique interest and passion in the technical aspects and tools of enforcement work. His strengths and accomplishments are reflected in the many special investigations he initiated and saw through to fruition. Many of those projects focused on the commercialization of natural resources. Gary has been the recipient of both an Amethyst and a Pride Award in recognition of his outstanding efforts and accomplishments. To be a recipient of the Conservation Officer of the Year Award an officer must be nominated by their fellow officers and then selected by a panel of appointed members from both the Ministry and the Ontario Conservation Officers Association (OCOA). This award acknowledges officers that have demonstrated the highest level of dedication and professionalism amongst our ranks and pays tribute to the high quality of Conservation Officers we have in Ontario. They must be an officer whose character is beyond reproach and demonstrate professionalism in every facet of their life. Gary Couillard was officially nominated by Conservation Officer, Tim Rochette, who presented highlights from his nomination submission during the official ceremony. Officer Dan Smith, recipient of the 2005 Officer of the Year was called on to present Gary with the Trophy Award for 2006. President of the Ontario Conservation Officers Association, Officer Jim McMullen also presented Gary Couillard with the OCOA Officer of the Year Award Plaque. Gary will also be presented with the Shikar-Safari International Wildlife Officer of the Year Award later this year. On behalf of the Minister of Natural Resources and the OCOA, we would like to thank Gary for his 32 years of service and commitment to the protection and conservation of the natural resources in Ontario. 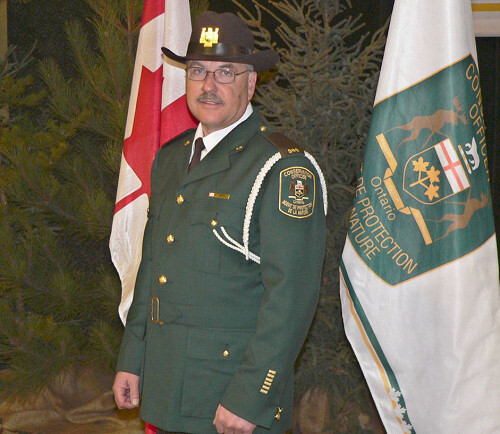 The Officer of the Year Award was established to acknowledge the outstanding efforts and contributions of our Conservation Officers and both the MNR and OCOA are proud to have Officers such as Gary Couillard working for the Ontario Ministry of Natural Resources Enforcement Branch.